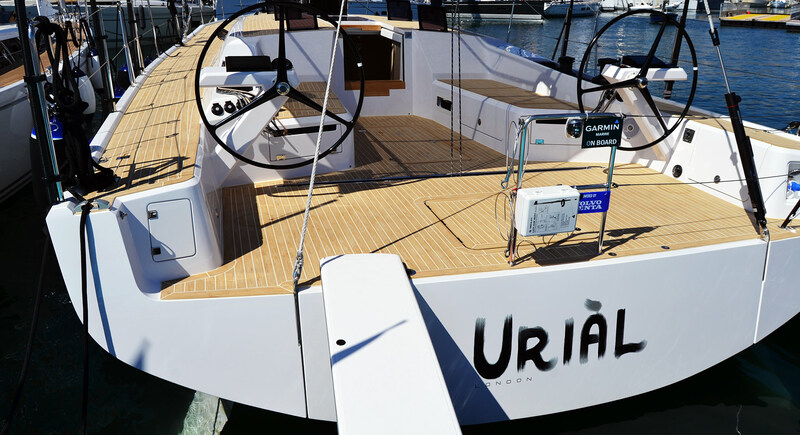 She surely was one of the more exciting boats to be seen on this year´s Cannes Yachting Festival and so THE FIFTY by young brand Eleva of Fano in Italy shall start the article-series on the boat show. 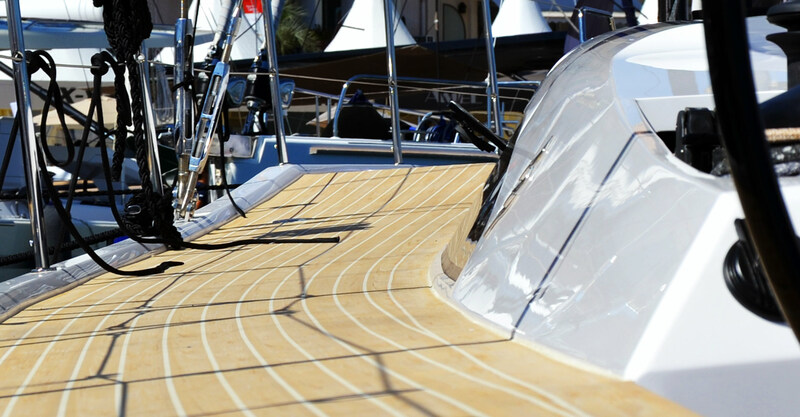 I first got to know of the boat just some few weeks ago when I prepared myself for the fair and was excited at an instant: I love fast sailing and I consider 50 feet as the perfect size for a yacht. So, let´s hurry down the pontoon and there she was: The 16.50 metres long (loa) and 4.86 metres wide new performance cruiser. A nice flat transom, double steering on sleek beams with nicely crafted consoles, the perfectly installed Teak deck with elegant white caulkings and a flat cabin superstructure: Unmistakably a Mediterranean style cruiser! I was welcomed by the crew of the boat who were excited to show me around. But before I entered her internals I was keen on having a look at THE FIFTY´s most prominent styling feature: The elevated bow. I don´t know if the brand´s name Eleva Yachts derived from this feat or vice versa, but apparently this is what most of the people were talking about when it comes to THE FIFTY. 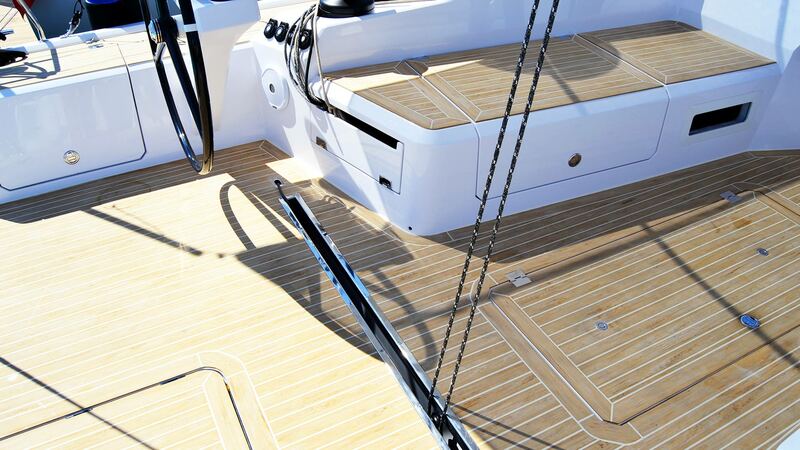 Looking down the clean walkways over the deck I instantly noticed the bend in the Teak decking as the bow is elevated by some 20 or 30 centimetres forward. I found it interesting to see that the Teak batten of the deck had been apparently mounted without any problems. No wonder, Eleva Yachts might be a new player on the market but the company – Carbon Line of Fano in Italy – is not. The company makes powerboat hulls for well-known brands like Azimut or Riva. They have therefore gained intimate knowledge in working with high tech low-weight materials like carbon fibres and advanced manufacturing techniques. The outcome is a very, very attractively designed fast cruiser that translates “speed” into a form that might be very tempting for owners who seek the unusual. Together with the elevated bow-concept, sleek hull windows and a racy, aggressive overall design the boat might appeal some owners who miss a certain extravagant boat in today´s line of products. Thanks to Ceccarelli Yacht Design THE FIFTY is now going to change that. As I was walking down the companionway I entered a mostly white, kind of cool and cold appearing salon. The boat is made in e-glass that has been re-inforced with a laminated inner structure and carbon fibres where lots of tension is expected. This technical approach can also be seen in the choice of material and colours: It´s just for the lacquered red dining table and the wooden veneered forward bulkhead that some colour is added. 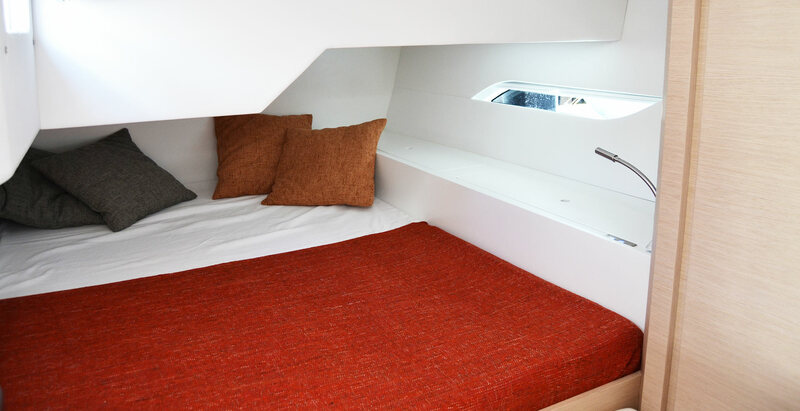 On port side a huge U-settee with a nice leather cushion is inviting guests and a tired crew after a long day out sailing fast. To starboard side two stools can be placed, a concept I had first seen in Nautor Swan yachts. The two-seater settee on starboard side kind of looks misplaced or being in second row but when the stools are removed it might change this picture. 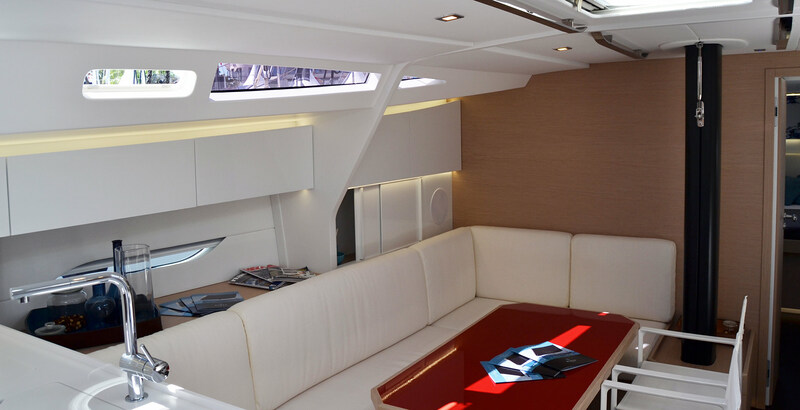 I also loved the reduced nav-station with the chart table readopting the lacquered red surface of the dining table. Very stylish. Nevertheless, for my personal taste, the boat was having too much white. But thanks to the yard, the choice of interior and exterior colours seems limitless: THE FIFTY can be made in no less than nine exterior colour-schemes, of which I probably would choose the black hull for sure. But what´s the real yield of that elevated bow? Standing in the salon I notice the porthole windows growing acute as the deck elevates. The salon boasts a very nice room height so that there is no need for more space above one´s head. But that changes as I enter the owner´s cabin: That´s clearly a new dimension here! I had no means of measuring the standing height but on the picture one can surely note that the ceiling is way up higher than on ordinary boats, even for a 50-footer, THE FIFTY´s room height is outstanding! There is so much headroom that the hanging lockers inside here offer a supersized volume. 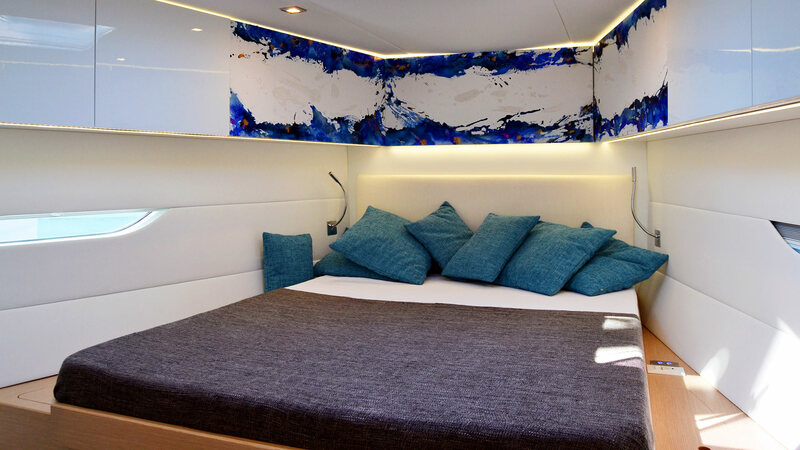 Interior design and the colour schemes chosen for this particular boat, wouldn´t have been my choice, but for the rest: That´s a mark A, no doubt! But how does she perform? Well, as it is the case for most of these nice boats I visit, there was no chance to sail THE FIFTY. Checking her specs I notice that there is 154 square metres of upwind sail area, which is just 4 square metres less than the Club Swan 50, another design icon, boats. The yacht weighs in 10.5 tons which is some 2.2 tons more than the Swan. No problem, THE FIFTY is a cruiser, not a thoroughbred racer. I guess she will perform well above average and may also occasionally be raced by her owners. I was appealed by the nicely done craftsmanship of this boat. I assume that the modern design of THE FIFTY will find fans – and hopefully more owners. 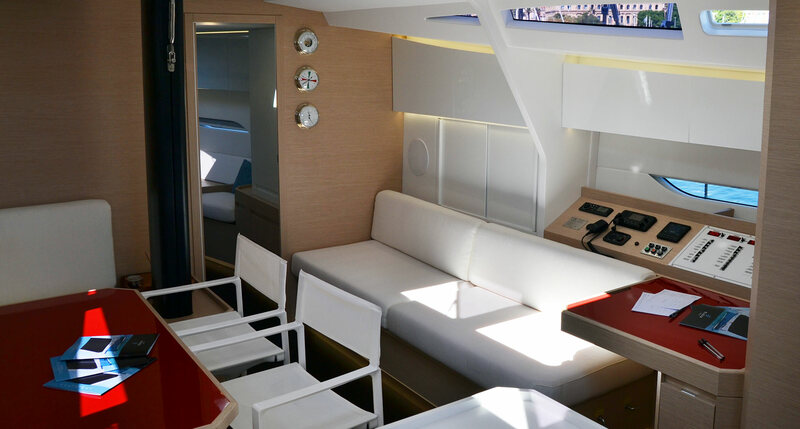 It was refreshing to see Eleva Yacht´s approach to designing a fast cruiser and I am looking forward to more models hopefully coming from Fano.